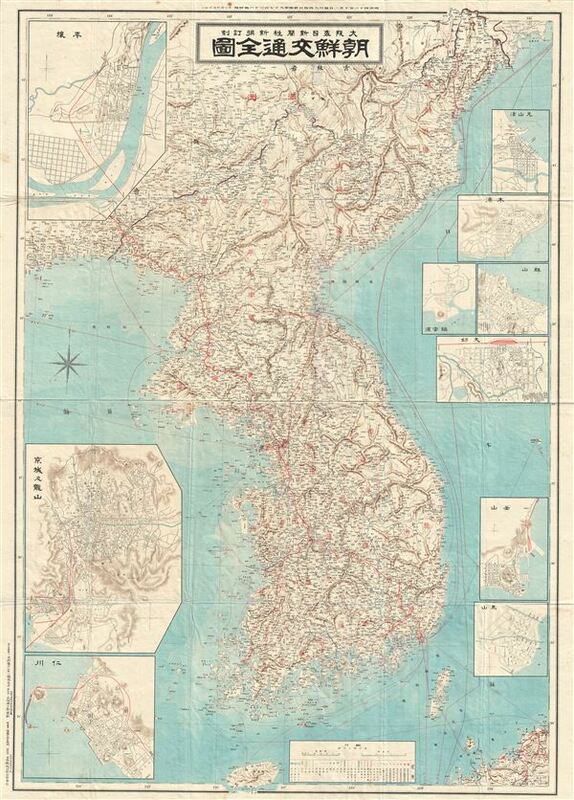 This is an unusual and appealing large format map of Korea (Corea) dating to 1910 or Meiji 43. This map of Korea made in the 43rd year of the Emperor Meiji's reign, covers all of peninsular Korea (Corea) as well as parts of adjacent Manchuria. The map proper is surrounded by ten inset maps detailing important Korean cities and ports, including Seoul, Pyongyang, Busan, Incheon, etc. All major towns, cities, provinces, roads, and railways are noted, including various other topographical details. Text is in Japanese. This map was printed by the Osaka Mainichi News in 1910.